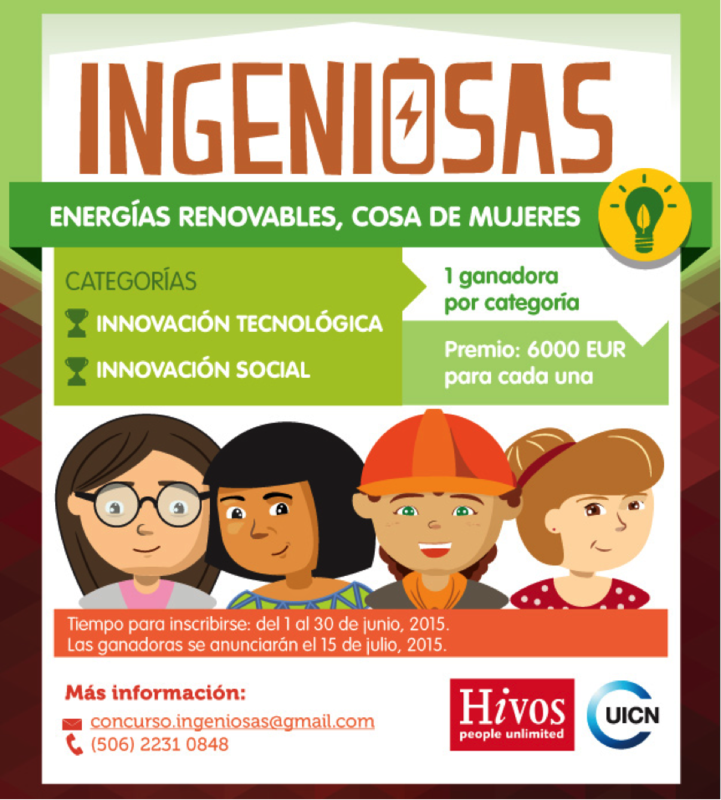 “Ingenious Women” is an innovation contest organized by Hivos and GGO. The initiative, promoted by HIVOS’ Green Societies Program, seeks to promote the creative and innovative role of women within the use and creation of renewable energy in Guatemala, El Salvador, Honduras, Nicaragua, Costa Rica, and Peru. The aim is to demonstrate that, in addition to being beneficiaries of fairer access to energy, women are also protagonists in the creative and technical process. Projects for consideration should be within the field of small-scale renewable energy, developed by individual women or women’s groups, and must be able to be implemented within four months of receiving the award. The winning project in each category will receive a prize of 6,000 Euros for project development and implementation. Winning entries will be chosen based on criteria outlined in the contest rules and application form. Projects will be evaluated by a panel of experts on gender and power and representatives of the organizing institutions. Application entry closes on June 30, 2015. The winners will be announced on July 15, 2015.